Operating and maintaining a public water system requires much more than collecting water samples and meeting state and federal reporting requirements. A PWS is a complex system that needs ongoing monitoring, maintenance, and management. For this reason, many businesses, schools, hospitals, and other organizations use Secondwind’s PWS Operator Services. In this month’s blog, we share a glimpse into the daily life of a Secondwind public water system operator. Before the morning coffee is even brewing, Secondwind’s PWS operators are checking schedules, stocking service trucks and coolers with sample bottles, completing any required paperwork, and touching base with the team. From there, coffee in hand, we hit the road. All equipment is clean and there’s no clutter around it. Switches and alarm lights are clearly labeled and working properly. The pump house is properly insulated and ventilated, and there is no sign of moisture or deterioration. 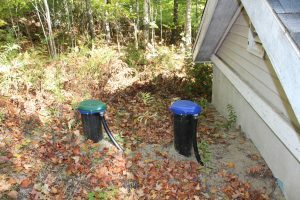 The pump house is clean and free of dust, debris, insects, and rodents. There is a safe and easily accessible path to the pump house and wellhead. The area around the pump house and storage tank is clear. The well is at proper height, and is sealed, dry. and sanitary. Some pump houses are part of the building, while others stand alone, like the one pictured above. 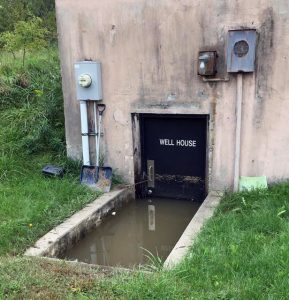 Here, we have direct access to the pump house to perform our routine inspections. Throughout the day, we will conduct onsite track meter readings. We also complete logs for filter changes, salt usage, run times, and more. We tailor our logs to be specific to the unique operation of each pump house. 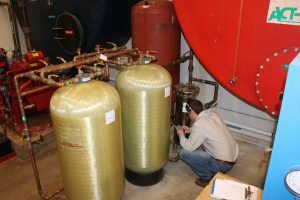 Depending upon the time of year, other daily public water system operator tasks may include system flushings, which help eliminate build-up in distribution plumbing. The goal is to help improve water quality and extend the life of distribution. Water quality can change dramatically from the time it leaves the pump house, to when it comes out of the tap. Flushing helps control these changes. One of the best known parts of a PWS operator’s daily tasks is taking water samples to comply with NHDES requirements. But at Secondwind, we collect additional samples to help predict treatment issues or possible media change outs. 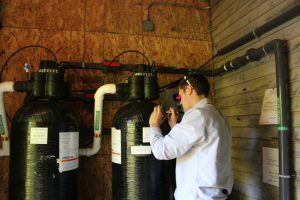 This kind of detailed evaluation ensures our customers get the highest quality water and helps extend the life of their treatment system. 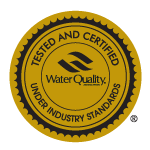 “As a water treatment company, we pay more attention to the actual results of the water samples we collect. We take the time to examine the numbers to see if there are any historical changes that could indicate future problems with the system,” says Steve Guercia, PWS manager at Secondwind. A tree crashes right through a pump house during a winter storm. Of course, like any job, not every day goes as planned. At times, certain elements—including weather-related emergencies—are out of our PWS operators’ control. “While we try to be proactive and prevent operational problems, but sometimes things happen and you just have to react,” explains Steve Guercia, manager of public water systems at Secondwind. “Emergencies mean we stop our daily routines and help resolve the issues as fast as possible, while supplying water to the community,” he adds. 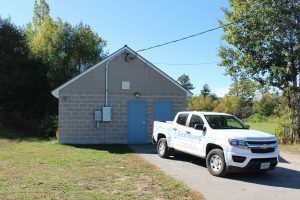 High rains caused water issues outside of this pump house. In this case, the pump house’s floor drain failed, causing water to back up into it. Secondwind’s PWS operators were on site until the issue was resolved and safe, quality drinking water was restored. 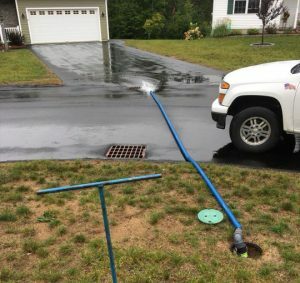 In the event of a water emergency, the Secondwind team will do whatever it takes to ensure our customers are supplied with clean, quality water. In some cases, we have arranged for bulk water deliveries to make sure this happens. 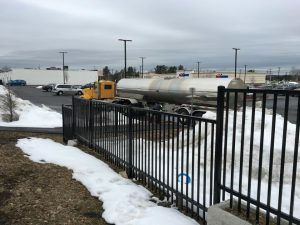 Per NHDES rules, an operator must be on site during these deliveries to ensure proper procedures are followed and water quality is evaluated. As you can see, a lot happens in a day in the life of a public water systems operator. And we know that between taking care of your customers, hiring and managing your workforce, promoting your business, and staying ahead of the competition, you may lack the bandwidth to effectively manage all of these responsibilities. If you would like help managing all or part of your PWS, contact the Secondwind team. 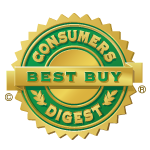 We’re happy to provide a free site evaluation. 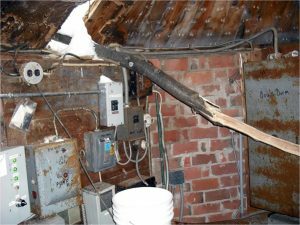 Pay Attention To Your Pipes!